Community Raffle Quilt. Quilted fabric. Queen size. Founded Wild Olympic Women 1991. 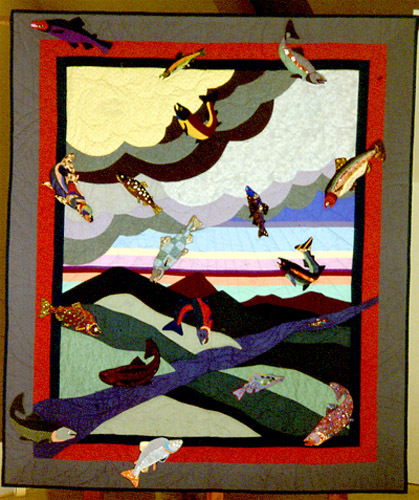 Collaborative creation of several extraordinary, successful raffle quilts for the salmon cause. Wild Olympic Salmon Festival 1988. Chimacum Park, WA. The artist was originator and coordinator. Design and concept of festival. Design of banners, charms, T-shirts, activities and many accoutrements of the festival in the decade to follow. See also Fin, the Migrating Salmon.